Very excited to let you know that we've set an official release date for my new book Mobile First. October 18th, 2011 the book will be available for purchase in print, PDF, ePub, and mobi formats from the fine folks at A Book Apart. 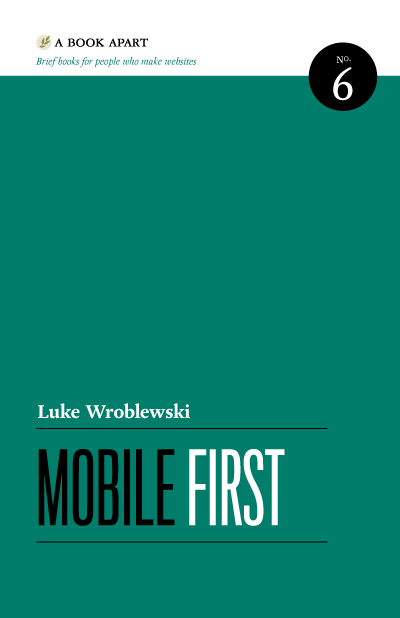 Mobile First is a short but information-packed book that makes the case for why Web sites and applications should increasingly be designed for mobile first and outlines how Web design teams can make the transition from designing for desktops/laptops to designing for mobile by specifying unique design considerations for mobile Web organization, actions, input, and layout. Sign up to be notified when the book is released. My original 2009 article making the case for mobile first. Video and audio of my Mobile First presentation.